Bulldog Bond Flex Tie-Coat is an adhesion promoter, flex agent, and tie-coat. It adds flex to paint and can tie metal to plastic. Provides adhesion to metals, rubber, fiberglass, and all type plastics including TPO and polypropylene. 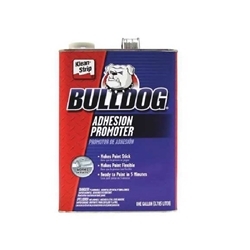 Bulldog Adhesion Promoter can be used for interior and exterior applications.